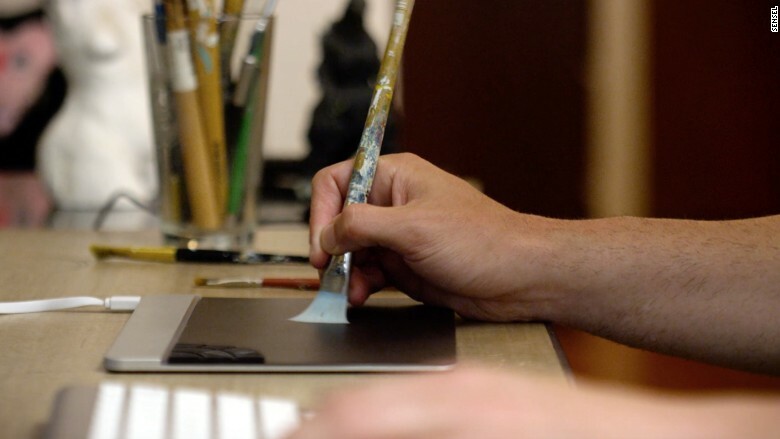 The Sensel Morph touch pad can be used with fingers, paint brushes, or any other nearby object. To use the Sensel Morph touchpad, you need an object. Any object. Your fingers, a stylus, a paintbrush, a banana. A flat metal rectangle with rounded corners, the Sensel Morph is about the same size as an iPad and a bit thicker than a mousepad. The gadget sits on your desk and connects with a laptop, desktop or tablet where it works with existing software, such as a paint program or game. Its pressure-sensitive surface can tell if you're lightly dragging a piece of fruit across the surface or jabbing a toothbrush down as hard as you can. The Morph is a new kind of consumer input device that can join (or possibly replace) your keyboard, trackpad, mouse, or Wacom tablet. When naked, it's like a supersized extra-sensitive trackpad. You can draw and write on it, drag a cursor or manipulate on-screen objects with your hand. But what makes it interesting (and fun) is what else it can become. Pop on an optional 3D silicon overlay and the Morph will turn into a keyboard, drawing tablet, piano, video game controller or drum pad. The touchpad automatically detects what's on top and interprets touch information accordingly, so it knows you're pressing the C key on a piano or hammering a fire button on a game controller. Sensel has made five of these covers already and plans on creating more to sell separately. Ilya Rosenberg and Aaron Zarraga started Sensel in 2013 after working together at Amazon (AMZN). As part of the concept engineering group, they worked on the Amazon Dash button and created the PagePress feature on the Kindle Voyage. Rosenberg has more than 10 years experience working on touch technology. At first, they weren't sure how to use the powerful technology they'd come up with. Unlike most trackpads and touchscreens, the high-resolution Morph can sense any object, including its shape. Where other trackpads are meant for a few pressure points, the Morph can track up to 16 different points at a time -- enough for all your fingers and a few of your friends'. It detects a nuanced range of pressure with its 20,000 sensors. "We realized everybody who sees it wants to use it for something different," said Zarraga. Instead of focusing on one use case, the Silicon Valley company decided to tap the Maker craze and open it up. In addition to the overlays Sensel makes, anyone with a 3D printer can make their own surface. Rosenberg and Zarraga imagine a store where artists and other creatives can swap designs for their custom skins or sell finished versions. To get started, they worked with a DJ school in New York on a custom overlay for DJ controls. During a demo, I played a ditty on the piano, painted and drummed while connected to a laptop. To show how sensitive the surface is, we placed a cup of coffee on top. The Sensel test application showed that it picked up the ring on the bottom of the cup. When the cup rocked, the Morph could detect the liquid sloshing around from side-to-side. The five-person startup already has some undisclosed funding and is working with a manufacturer in China. On Tuesday, it launched a Kickstarter campaign to raise $60,000. The Senel Morph will start at $199 and come with three overlays. Sensel hopes to have a final version for sale by next June.